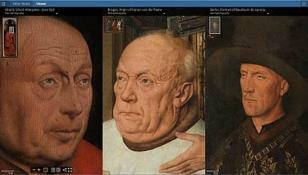 The Royal Institute for Cultural Heritage in Brussels (KIK) and Musea Brugge/kenniscentrum vzw have published high-quality image material of 20 works by Jan van Eyck from 11 museums on the existing website: Closer to Van Eyck. Between 2014 and 2016, the art historians of the Centre for the Study of the Flemish Primitives of the KIK and their colleagues from the imaging department rendered nearly the entire oeuvre of Jan van Eyck (ca. 1385/90-1441) into image form. In the framework of this so-called VERONA project (Van Eyck Research in OpeN Access), macro-photos, infrared images and x-rays were made according to a standardised procedure. The image material is published on the website Closer to Van Eyck on which similar images, which were created following the same protocol, of the Ghent Altarpiece are to be seen for some time already. Comparative research on the basis of equivalent and high-quality image material can now proceed more objectively and be verified by everyone. Art lovers shall be able to discover the inimitable technique of Van Eyck in a never-before seen manner. Moreover, they will be aided by the intuitive user interface of the website. Bart Fransen, project promoter and chief of the Centre for the Study of the Flemish Primitives of the KIK says: That from one day to the next the whole world receives viewings in high-quality macro-images of the oeuvre of Van Eyck is, without exaggerating, truly revolutionary. For such a large-scale project the collaboration of numerous museums was crucial. Musea Brugge, which allowed the Madonna with Canon Joris van der Paele and the Portrait of Margaretha van Eyck to be examined, delivered via their research centre a structural contribution to the digital imaging and the web application by which the implementation was taken care of by the Free University of Brussels and Universum Digitalis (Brussels). Till-Holger Borchert, Director of Musea Brugge says: The VERONA project provides a new dimension to "open access" within art history. The project is not yet completed. Up until 2019, the VERONA team of the KIK, sometimes accompanied by colleagues from Bruges, shall travel in and around Europe in order to research and document the remaining paintings of Jan van Eyck and his studio. This material shall also be offered in high resolution via open access on the website. The VERONA project is financed by the Federal Public Planning Service Science Policy (BELSPO) within the framework of the BRAIN programme (Belgian Research Action through Interdisciplinary Networks) and enjoys the support of Musea Brugge and the co-operation of Closer to Van Eyck.